« Anyone up for a shoot tonight? Some days are diamonds and other days you just get lucky. Well yesterday was both. Its been five weeks since I’ve ventured out to take a serious photo, not sure why probably a little battle fatigued from a pretty tough year. I just had to get out last night and ‘recharge’ my batteries, I hopped in the car and with no particular destination in mind just started to drive. Those who know me well enough would know that I instinctly drove to the coast for my recharge. I hit the coast at Port Beach near Fremantle, and headed past Cottesloe Beach, Scarborough and then past Trigg Beach. Finally I decided to hop out of the car and below me I saw a really small group of rocks that were just begging to have their photo taken. Being the ever obliging seascape photographer that I am, I grabbed my camera gear and walked down to the beach and setup my gear. After being there for an hour and working out my shots the sun finally set and I got to work. The joys of taking seascape photographs came flooding back into my veins, I felt alive again and I think the joy of coming alive again were reflected in my photos. I’m really happy with this one. Where do you guys go for your recharge? Is it just taking photos itself that recharges you, or do you have a certain location that you gravitate to? I hope you guys enjoy looking at it as much as I did taking it. All comments are greatly appreciated. This entry was posted in Australian Landscapes, Australian Seascapes, Sunset Photos and tagged australia, Australian Landscapes, Australian Seascapes, australian sunsets, beach, Jamie Paterson, landscape, landscape photography, long exposure, ocean, perth, seascape, seascape photography, sunset, waves, western australia. Glad you enjoyed. Its probably one of my favourites for the year. Great post and very nice image Jamie. Only thing, I feel perhaps the horizon is too high in the frame. Love your writing on photographic recharging. I am sure most landscape photographers and landscape lovers feel this way. Just shooting any photo for me is far from enough. Has to be some Mother Nature magic at work. I would say my ultimate recharging is somewhere completely untouched. Kinda rare, I don’t get to theee locations as man has ruined many a location so I have also gotten good at blocking everything else out. Like my mind is a viewfinder. I see only the magic part, Mother Nature’s work – I block out the fact that there are other people there and perhaps a car park 200 meter behind us. Still, it is not as good as say pure untouched desert or coast like James Price Point in Broome! Thanks for a great and insightful comment. I’m like you I can sit in the middle of Cottesloe Beach and in my mind be the only person on the beach. Its important to be able to block some things out. We’d go crazy if we didn’t. Seriously it is a great shot, good work finding a location like that. Thank you very much. Its always a nice feeling when you find a great little spot like this. Thanks for dropping by and commenting. The water effect isn’t that hard to achieve, you just need to make sure that you’re taking the photo around sunrise or sunset. Nice one Jamie. It certainly was a lovely sunset, I was watching the colours and clouds do there things whilst cooking a BBQ for a Christmas celebration with some neighbours. I’ll have to keep an eye out for this spot, I think it’s only 5 minutes from where I live. I’m guessing it some where around mettams pool? I’m pretty sure its North Beach itself. Great detail in the rock surface and beautiful light to go with it Jamie. I think the blurred water offsets it nicely. I’m like you I need to get out and photograph something special to get my fix I can’t just take photos of anything. Thanks for dropping by and commenting. Yeah a scene / obeject really needs to move me before I want to capture it. I’m glad you liked it. I too just love the water movement. Its a great feeling when something like this unfolds before you. Nice work mate…one of your better ones for sure! Thank you very much for that. Great compliment. great scene mate, well done finding that in Perth! Thanks for that mate. I thought it was a good find. 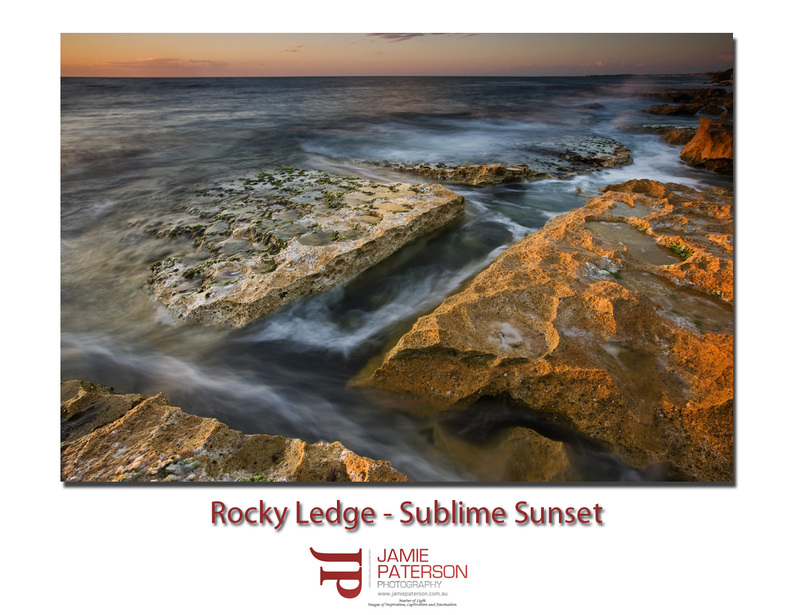 Great tones in this one Jamie, looking forward to getting myself a few seascapes this chrissy break. Thank you very much mate. Where are you off to this Chrissy break? Hey Jamie, is the secret watermans spot ! I believe its North Beach. Its definitely not a secret. 😉 I was talking to Mike Fletcher yesterday and he said you would be down. I’ll be in Dunsborough but I’m keen to catch up. Very sublime indeed Jamie. Great find and well done. Thank you very much. I hope you and your family have a great Christmas and New Year as well. Yes I’m sorry we didn’t catch up. Unfortunately, my car was very sick and we had to come back up a week earlier than expected. I wasn’t happy at all.